The Nashville Predators have announced another open house with a free open skate on the Bridgestone Arena ice before it is removed for the summer. There will be plenty of other activities including the always popular Predators Foundation garage sale as well as many other specials. Join us for a night of fun at Bridgestone Arena! What a great season in Smashville! 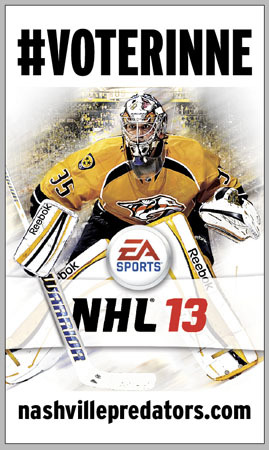 Though it ended too quickly, the 2011-2012 season was filled with great moments like the clinching victory over Detroit in Game Five of the first round and the franchise record 30 regular and post season sellouts at Bridgestone Arena. As a thank you for your support throughout the season we’d like to invite you to join us next Wednesday, May 23 from 5-8 p.m. for a night of fun at Bridgestone Arena. Open skate with free skate rental. If you plan on skating, please click here to RSVP (even if you have your own skates). Free parking will be available in the Sixth Avenue (on the corner of Demonbreun and Sixth Avenue) garage for you when you arrive (based on availability). Nashville Predator prospect Austin Watson was named the OHL Player of the Week today after his London Knights team captured the OHL crown, which advances them to the Memorial Cup. Watson was also given the Wayne Gretzky 99 Award for being the MVP of the OHL playoff as he had ten goals and seven assist in 19 playoff games. The 20 year old forward prospect is in his last year of junior hockey and hopes to compete for a position with Nashville in development camp this summer and in the preseason camp in September. After a mediocre 5-3 record in the opening round, we fared even poorer in the second round with our predictions, going 2-2, missing on the Predators and Flyers. Obviously, if you are headed to Las Vegas, you may want to consider someone with a little better track record than we have had. Irregardless, we'll take another crack at our projection for the Conference Finals. Both series are very difficult to size up and neither offer a team that would be considered a heavy favorite. 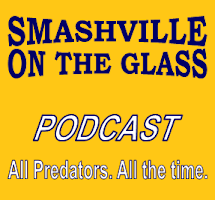 This weeks edition of Smashville On The Glass Radio featured David Boclair, Predators' beat writer from The City Paper to discuss the abrupt ending to the season as well as the upcoming free agency period that involves the majority of the Preds players. In June of 2003, the annual NHL Entry Draft was held at the current Bridgestone Arena in the middle of the lower Broadway honky tonk row entertainment district. At the time, the Nashville Predators had just completed their fifth season and had never made the playoffs. The Preds chose defenseman Ryan Suter with the seventh overall pick in the first round. In the second round, they chose fellow D-men, Kevin Klein (35th) and Shea Weber (37th) and the three have been together in the Predator organization ever since. Since that draft, the Predators have made the playoffs seven of the last eight seasons and the three defensemen have become the cornerstone of a solid defensive core for which the team has become known. Since making the Predators out of camp after the lockout in 2006, Suter has played 542 NHL games and 39 playoff games over the course of seven seasons, all in Music City. Craig Smith of the Nashville Predators has been added to the Team USA squad that is competing at the IIHF World Championships in Helsinki, Finland. Smith, who just completed his rookie season in Nashville, will be playing in his second consecutive World Championship tournament after making his debut as a collegian last year. Predators' General Manager David Poile put together the most complete group of players for a long playoff run that the Nashville Predators had every had. However, in the end, it was Mike Smith of the Phoenix Coyotes who stole the second round series that few gave the Coyotes a chance to win against the stacked Nashville squad. Smith has to be considered a leader for the Conn Smythe Trophy if the Coyotes continue to advance. Phoenix took the series 4-1 taking game five 2-1 on home ice at Jobing.com Arena. It was a complete day of celebration in the desert with NHL Commissioner Gary Bettman announcing that former San Jose CEO, Greg Jamison would soon be buying the Coyotes from the NHL. On the ice, players and fans celebrated the Coyotes first trip to the conference finals where they will face the Los Angeles Kings, most likely, starting this weekend. For the Predators, they are left to wonder what happened and are looking at an offseason of free agency that will possibly reshape several key players of the franchise. Phoenix got goals from Derek Morris and Martin Hanzal while the Predators' only goal came from Colin Wilson in the closing minutes that made the finis interesting. Smith was incredible in net, stopping 32 of 33 Predator shots while Pekka Rinne was solid stopping 15 Coyote shots. In the end, it was clear that Phoenix had outplayed the Predators and deserved to move on. The Predators could only be faulted for running into a hot goalie at the wrong time. The postgame handshake like was as classy as you could see with two of the best coached teams in the NHL showing the character of their leaders with sincere congratulations up and down the line. For sixty minutes, the Nashville Predators and the Phoenix Coyotes played as close a game as possible but Shane Doan's goal in the opening period was the only puck to find the net in a 1-0 win for the Yotes that gave then a commanding 3-1 series lead. Time after time, the Predators had scoring chances from ideal locations that either missed the net or were stopped by Coyote goalie, Mike Smith. The Predators were somewhat slow out of the box, only getting four shots on goal in the opening period, but skated much better in the final two periods and created plenty of chances. The Phoenix defense play a solid game in front of Smith, giving him all the support that he needed in throwing the shutout at the hometown Predators. As had been seen twice before in the series, in games one and three, an apparent Predator goal was waived off by the officials due to a whistle being blown. The play in question on Friday came with 7:12 left in the game when Mike Fisher nudged the puck over the line as Smith slid into the goal. The official explanation from the league was that the goal was waived off due to the whistle being blown. There was also an indication in the postgame from Preds Coach Barry Trotz that the players were told that that Patric Hornqvist had pushed Smith into the net so it is obvious that there was confusion as to why the goal was disallowed. Regardless of the controversy, the Predators are in a deep hole and are faced with winning three games in a row if they plan to advance to the next round. After sticking with the same lineup in Friday's match as in game three, Trotz indicated that he would reevaluate and probably make changes for game five. After sitting out the first six games of the playoffs, Colin Wilson has proven to be one of the better players on the ice in the last three games and picked up third star honors for his hustling two-way play. He has played well on a revamped line with Nick Spaling and college teammate Brandon Yip. Patric Hornqvist was also a dominant force for the Preds as he appeared to have more scoring chances than anyone in the game as he launched twelve pucks toward the net but only three were credited as official shots. Mike Smith stopped all 25 Predator shots while Pekka Rinne stopped 23 of 24 Yotes shots and could not be faulted for the lone goal as it appeared to have been tipped, possibly more than once. Every game to this point, with the exception of the Predators' dud in game two, has turned on a break here or there, so anything is possible in the remainder of the series. The Predators will have an off day on Saturday and then practice on Sunday before flying back to the desert to face the Coyotes at 9 p.m. CDT at Jobing.com Arena on Monday. Special start time for game four of Preds-Yotes - Don't be a straggler! Game four between the Nashville Predators and the Phoenix Coyotes has a special start time of 6:30 p.m. CDT so time is off the essence in planing your pre-game activities. Few tickets remain and you best chance may be the 10 a.m. day of game lottery. Minimal tickets will be available at the Bridgestone Arena box office. This offer is very limited (50 pairs, 100 total tickets) and will be conducted by lottery. Attendees of Friday's game will receive gold out T-Shirts courtesy of Bridgestone. For those who cannot attend, the game will be on the NBC Sports Network with pre-game coverage leading in to the 6:30 p.m. main telecast. Doors will open at 4:30 p.m. and the Predators will also play host to a massive plaza pary beginning three hours prior to faceoff ( 3:30 p.m.) in front of Bridgestone Arena with live music, video screen, inflatables, gaming trailer, smash car, face painting, and a huge viewing party on Broadway. The Nashville Predators played "Predator" hockey as they closed ranks and defeated the Phoenix Coyotes 2-0 in game three of the Western Conference semifinals. Pekka Rinne garnered his first career playoff shutout as he stopped all 32 Phoenix shots. Playing without Alexander Radulov and Andrei Kostitsyn, the remaining players made up the difference and more as Nashville played the best game of the playoffs to date. The Predators scored twice, 66 seconds apart, midway through the first period, and then shut down Phoenix with stellar defense the rest of the way. Goals from David Legwand and Mike Fisher was all Nashville needed in closing the gap in the series to 2-1 with the Coyotes having the advantage. Mike Smith stopped 24 of 26 Predator shots, taking the loss. Game four in the series will return to Bridgestone Arena on Friday night at 6:30 p.m. CDT. In Goal: Nashville - Pekka Rinne (4-3-1, 2.51, .919) and Phoenix - Mike Smith (6-2-2, 2.03, .943). Nashville - Jon Blum, Craig Smith, Chris Mueller, Brian McGrattan, Kyle Wilson, Jack Hillen, Andrei Kostitsyn, Alexander Radulov, Victor Bartley, Ryan Ellis, Jeremy Smith, and Chet Pickard. Phoenix - David Runblad, Connor Murphy, David Schlemko, Paul Bissonnette, Chris Summers, Andy Miele, Michael Stone, Lauri Korpikoski, Matt Watkins, Raffi Torres, Brett MacLean, Alexandre Bolduc, Brett Hextall, Ethan Werek, Maxim Goncharov, Jordan Szwarz, Justin Pogge, and Louis Domingue. The revamped line-ups looked similar to the ones prior to the trade deadline without Radulov and Andrei Kostitsyn. Hal Gill and Paul Gaustad would be the only additions in the line-up. The Smashville crowd was as loud as ever and appeared to enjoy seeing Jordin Tootoo in the line-up with plenty of Tootoo whistles ringing out. The Predators went on their first man advantage at 5:04 when Marc-Antoine Pouliot held Colin Wilson's stick. The Preds were unimpressive, getting only one shot while giving up two short-handed shots. The Predators got on the board first at 8:10 when Smith left his net to play the puck and could not get back to defend as the puck was turned over to Gabriel Bourque who made a feed to Legwand who scored. Sixty-six seconds later, Marty Erat stole the puck in the Predator offensive zone and passed it to Sergei Kostitsyn in the slot, who fed it to Fisher who then banked the puck into the net off of Smith's stick to give Nashville a 2-0 lead. Phoenix went on their first power play at 11:04 when Fisher was called for interference on Martin Hanzal. Phoenix did not get a shot while the Preds has a couple of chances on turnovers while short-handed. Another Predator goal was blown off at 13:49 when the play was blown dead prematurely. Video replay clearly showed the whistle blew after Smith let the puck leak into the net on the Legwand shot. Legwand was whistled for hooking Antoine Vermette at 15:39 to put Phoenix on the man-advantage. With 10 seconds left in the penalty. Derek Morris hooked Mike Fisher to give the Preds a power play opportunity. The Coyotes had the best opportunities with a pair of short-handed shots in the odd man situation. The Predators went on the power play at 5:58 when Adrian Aucoin was called for interference when he tripped Matt Halischuk sending him into a hard collision with the boards. Halischuk went straight to the dressing room. The Preds got a shot but no goals. Hanzal took a hard hit from Fisher at 9:03 and he cringed as he left the ice. Rinne made a pair of saves at 11:12 that were easily the saves of the game. Halischuk returned to the ice for a shift at 14:11. Nashville went back on the power play at 15:18 when Morris cross-checked Erat. Boyd Gordon left the game during the man-advantage after taking a Shea Weber shot to the arm. The Predators got a great scoring chance but did not not score. Thursday may not be a game day at Bridgestone Arena but that doesn't mean that the building will be dark. The Nashville Predators will hold an open house from 4 to 8 p.m. where you will be able to purchase tickets for next season and take part in a public skate for a small charitable donation. The Nashville Predators will face the Phoenix Coyotes in game three of the Western Conference Semifinals on Wednesday night at Bridgestone Arena. The contest is being brought to you by Nissan and all fans in attendance at Game Three will receive Rally Towels courtesy of Nissan. Despite the suspensions of Alexander Radulov and Andrei Kostitsyn, the cupboards are full with multiple players waiting in the wings wanting an opportunity to play. Matt Halischuk, Jordin Tootoo, and Craig Smith are possibilities as well as Colin Wilson who saw his first action of the postseason on Sunday in Phoenix. Doors will open at 6 p.m. and the plaza party will start at 5 p.m.(weather permitting). Daily’s post-game radio show will broadcast from the 102.5 The Game studio outside section 119 on the main concourse after the game. Additionally, post-game festivities will continue on the plaza with live music, a beer garden and more. A limited number of Day of Game tickets for $10 each at the box office at Bridgestone Arena at 10 a.m. This offer is very limited (50 pairs, 100 total tickets) and will be conducted by lottery. Individual tickets are available for all possible second-round games and can be purchased at nashvillepredators.com, by calling 615-770-PUCK (7825), stopping by the Bridgestone Arena box office, all Ticketmaster outlets or by visiting ticketmaster.com. In a brief release with little detail, the Nashville Predators announced that Alexander Radulov and Andrei Kostitsyn would be suspended for the Predators' game against Phoenix at the Bridgestone Arena on Wednesday night. The Nashville Predators recalled five prospects from the Milwaukee Admirals who completed their season last weekend. Jonathon Blum, Victor Bartley, Chris Mueller, Kyle Wilson, and Jeremy Smith will finish the year in Nashville and experience the Stanley Cup Playoffs first hand.